Glencairn Museum News 27.1 (2005): 13. 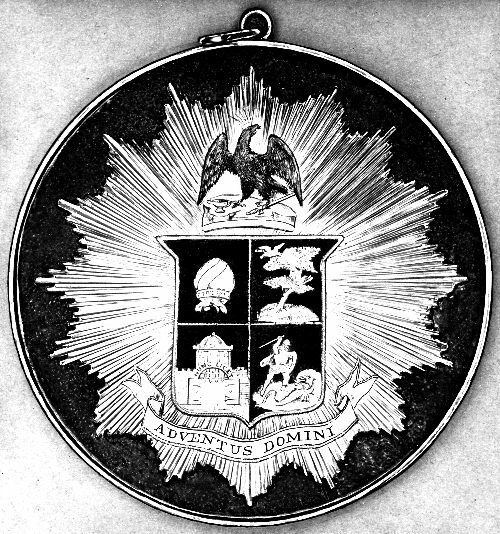 The first meeting concerning the seal occurred in the spring of 1877 in W. F. Pendleton's study in Philadelphia. The seal decided upon at this time "was similar to that which was later adopted, except that the crest was an eagle." The job of producing a formal design was given to the Dreka engraving house in Philadelphia, which later created the seal of the United States Senate. The artists were unable to produce a satisfactory eagle, and in December of 1877 the decision was made to replace the eagle with a lion. The original watercolor design (above) is now on exhibit in the John and Gertrude Pitcairn Archives. Click on image for a larger version. "I can still see him in the chancel in his ruby silk robe with the medal on his chest displaying the Academy lion." In a 1966 Assembly banquet speech, Raymond Pitcairn shared this childhood reminiscence of Chancellor Benade wearing a medallion with the Academy of the New Church seal.1 Glencairn Museum has in its possession three medallions, each with a different version of the seal, from the early days of the Academy. The materials used in these very colorful medallions are silver, gold and enamel. The location of the medallion worn by William H. Benade in this photograph is unknown; it appears to be larger than the "lion" medallion now in the Museum's New Church collection (05.JW.99). The photo, now in the Museum's archives, was autographed by Benade on May 13, 1892. Click on image for a larger version. The Academy seal, so familiar to many of us, consists of a shield divided into four parts: top left, priest's mitre; top right, eagle protecting her young; bottom left, Nunc Licet temple; bottom right, Michael slaying the dragon. The shield is surmounted by a crowned lion with keys under his paws, and beneath the shield is a banner with the Latin words Adventus Domini (The Advent of the Lord). The quadrants of the shield are anchored in the middle by the Greek letters alpha and omega. The symbolism of the seal is as follows: "The lion at the top of the seal was to represent the Lord's Divine Human, the keys signifying the power of His Divine truth; the mitre was to represent the priesthood; the eagle brooding over her young was to represent the instruction of the young; the temple bearing the legend Nunc licet was to signify the New Church; and Michael and the dragon the New Church fighting against the falsities of the former church. "2 The identification of the different Academy schools with the symbols in each of the quadrants was a later development, occuring at various times after the official adoption of the seal. Raymond Pitcairn, an ardent supporter of the Academy, had several prominent depictions of the seal created for Glencairn, the largest and most dramatic of which is the monumental mosaic surrounding the archway to the Upper Hall. The seal design continues above the third floor balcony door, with the mosaic of the crowned lion. The seal was also carved in stone above the chapel's doorway, and painted on one of the plexiglas lampshades created for the chapel by Frank Snyder (11.OP.01). The job of producing a formal design for the seal was entrusted to the Dreka engraving house in Philadelphia. The founder, Louis Dreka, is noted for having produced a new seal for the United States Senate in 1885. Walter C. Childs was responsible for working with Dreka to produce a design. He was assisted in this effort by Maria Hogan. Drawing of "eagle" medallion (05.JW.98). Origin of drawing unknown. "Eagle" medallion produced by Dreka (05.JW.98). Gift of Maria Hogan. On the "eagle" medallion, the Academy seal is surrounded by golden rays on a gray-blue enamel background. The crest is a crowned eagle poised for flight, perched on a piece of rock with a sword and lamp at his feet. The shield is divided into four parts: the top two quadrants have a red enamel background, and the bottom two have a blue-grey one. 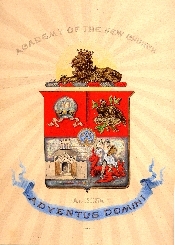 Beneath the shield is the banner inscribed with Adventus Domini. The four quadrants of the shield depict the symbols familiar to us today, but the top right and bottom left images are interesting for the subtle ways in which they differ from later designs. The eagle on the top right is a very small bird in flight, about to land on a full-sized tree, not at all like the large seated eagle of the present seal. The Nunc Licet temple on the bottom looks distinctly more fortress-like than it does today, with a gate that appears to have a raised portcullis and a strong stone wall behind it. By March of 1878, nearly a year after the original Academy meeting about the seal, Dreka had finally produced a new design with the lion. In a diary entry dated March 18, Gertrude Starkey wrote, "In the evening the 'Saints' gathered at Dr. Boericke's to welcome Mr. Bowers who had come on for his family. We had the beautiful coat of arms prepared by Dreka [07.WC.1452, see above] to enjoy that evening . . . The badge was given into my care and very much delighted was I with the fact." In an earlier entry on March 5, she had noted that "Mr. Childs and Mr. Carter came up to consult about the important matter of a ribbon for the Vice Chancellor's badge. The purchasing was entrusted to me. "8 This "badge" may be Glencairn's "lion" medallion (05.JW.99, above). 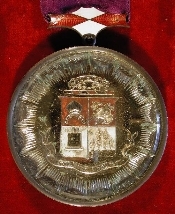 The "lion" medallion was worn by William F. Pendleton as vice-chancellor of the Academy, and remained in the Pendleton family until 1976 when it was given to the museum. 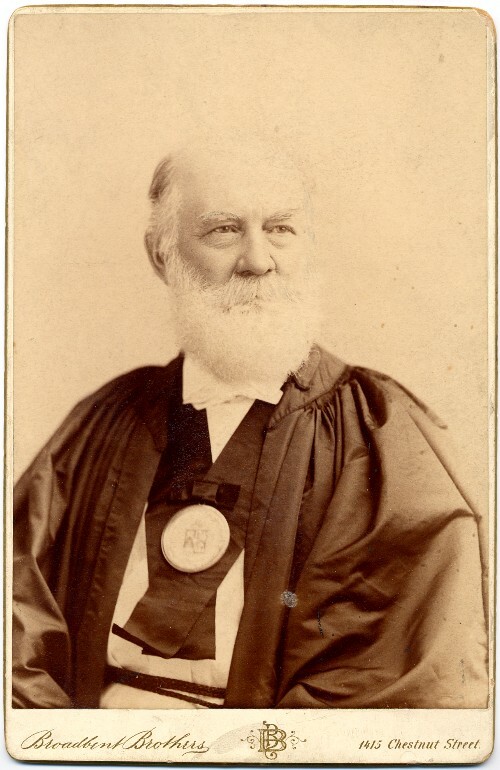 Pendleton was made vice-chancellor, by Chancellor Benade, in May of 1888, and "having received Bishop Pendleton's acceptance of the office of Vice-Chancellor, the Chancellor placed upon him the badge of his new office . . ."9 Is Glencairn's "lion" medallion, given to Pendleton in 1888, perhaps the same one entrusted to Gertrude Starkey in 1878? In 1878, when she was consulting on a "badge" for the vice-chancellor, James Park Stuart would have held that position. 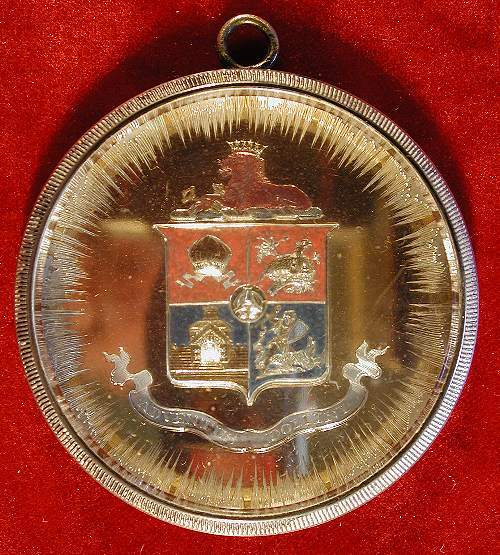 Stuart died in 1882, so the medallion may have been passed on to Pendleton when he became vice-chancellor in 1888. More research will be needed to answer these questions. Glencairn's "lion" medallion has all the symbols found in the present-day seal. The shield sits on a gold background with silver rays on the edges of the circle. A red enamel crowned lion sits in repose with two keys under his paws. 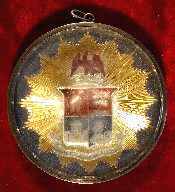 The shield has two red enamel quadrants on top and two blue ones beneath. The Nunc Licet temple still looks more fortress-like than the one in the final version, but less so than on the "eagle" medallion. The eagle on the top right is now a large bird sitting on her nest on a branch. Curiously, the eagle faces right, unlike the Dreka painting of 1878, which has the eagle facing left. (The present-day version has the eagle facing left.) A new element, also found in both the Dreka painting and the present seal, is the alpha and omega in a circle at the center of the shield. Perhaps the most intriguing of Glencairn's medallions has neither an eagle nor a lion as the crest. It also has the greatest number of design variations from the present-day version of the seal. There is an old leather jewelry case in the Museum's New Church collection that fits this medallion but not the other two. The cloth lining the case is very similar in color to the ribbon attached to the medallion (royal purple). 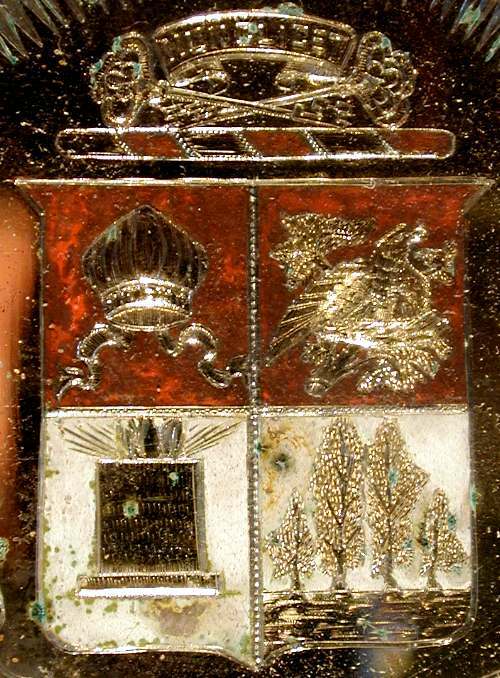 Inside the lid of the case is printed "R. M. Johnson & Son, Masonic Jewelers, 67 Washington St. Chicago." It seems safe to assume that this is the jeweler who produced the medallion. The seal design on this "mystery medallion" is quite different. Like the "lion" medallion, the shield sits on a gold background with silver rays radiating out at the edge of the circle. Above the shield are two keys resting on a red and white striped baton-like object (exactly like the one the lion rests on today). The keys may here be a reference to Matthew 16:19: "And I will give you the keys of the kingdom of heaven." A banner with Nunc Licet rests between them. The top two quadrants of the shield have a red enamel background, and the bottom two are white. The top right eagle, sitting on her nest, looks very similar to the one on the "lion" medallion, and is similarly facing right. The two bottom quadrants are the most intriguing. The bottom left depicts what appears to be an altar of fire. A clue to the intended symbolism of this altar may be found in Arcana Coelestia 10273, which states that an altar of burnt offering is "the principal representative of the Divine Human of the Lord and of the worship of Him." The bottom right quandrant of the shield has two large trees with two smaller ones on either side. The inspiration for the four trees may come from Arcana Coelestia 5051, where they represent conjugial love: "I once saw some trees . . . one of which was tall, another shorter, and two were small . . . When I woke up from my sleep I talked to those among whom my dream had originated . . . Who told me what was meant by that sightconjugial love." However, there is no documentation to support this theory. The fact that the "keys" medallion has the greatest number of design variations makes it tempting to assume it is the earliest in date. However, some of the elementsthe eagle, the baton, the keysseem more closely related to the seal's final design. The Museum would be grateful for any information our readers might have concerning these three historic medallions. 1Gaskill, Jennie, Biography of Raymond Pitcairn (Bryn Athyn, Pennsylvania: n.d.), p. 18. 3 Pendleton, William F. Letter to Walter C. Childs. 7 February 1918. Academy of the New Church Archives. 4 Childs, Walter C. Letter to William F. Pendleton. 13 February 1918. Academy of the New Church Archives. 6 "The Origin of the Academy Seal," in New Church Life (October, 1953), p. 435. 7 Childs, Walter C. Letter to William H. Benade. 6 January 1878. Academy of the New Church Archives. 8 Pitcairn, Gertrude S. Diary entries for 5 March 1878 and 18 March 1878. John and Gertrude Pitcairn Archives. 9 See "College Letters," Philadelphia, Pa., Academy of the New Church, no. VII, 1 Sept. 1888, p. 18.